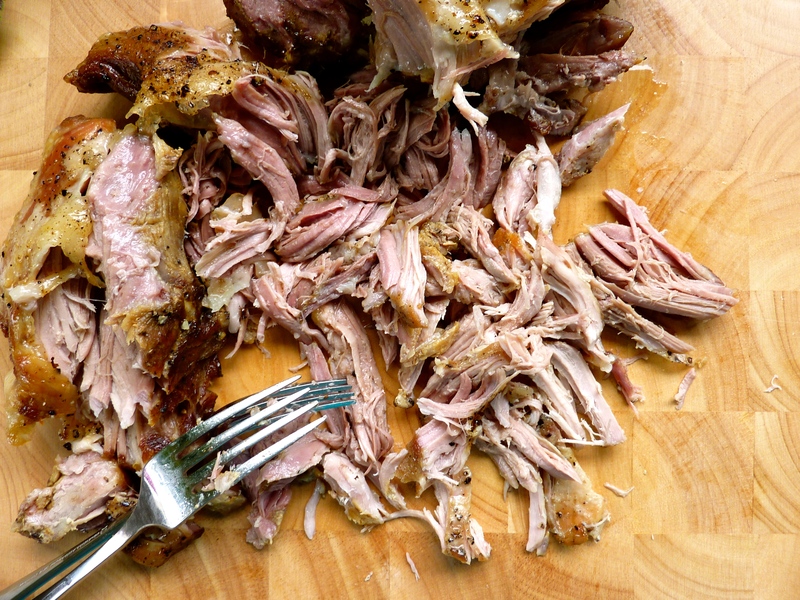 If I had to choose my favourite cut of pork, and how I best liked to cook that cut, I’d choose a shoulder of pork. It would come from free-range-bred pork and it would be slow cooked in the oven for 3-4 hours on a roasting rack with a little cider, or beer, in the bottom of the pan, and covered with foil to keep it moist and trap the flavours in. This amazingly easy method of slow cooking the pork means the meat can be ‘pulled’ with just a gentle pry using two forks. I’ve written this recipe to ensure there is pork left over. If you’re to go to the trouble of having the oven on for 4 hours it’s best to have left over pork for making a fast yet delicious meal the next day. The salad will serve four people and will, at best, use half the pork. The fresh ingredients that make the salad are just as wonderful as the pork. 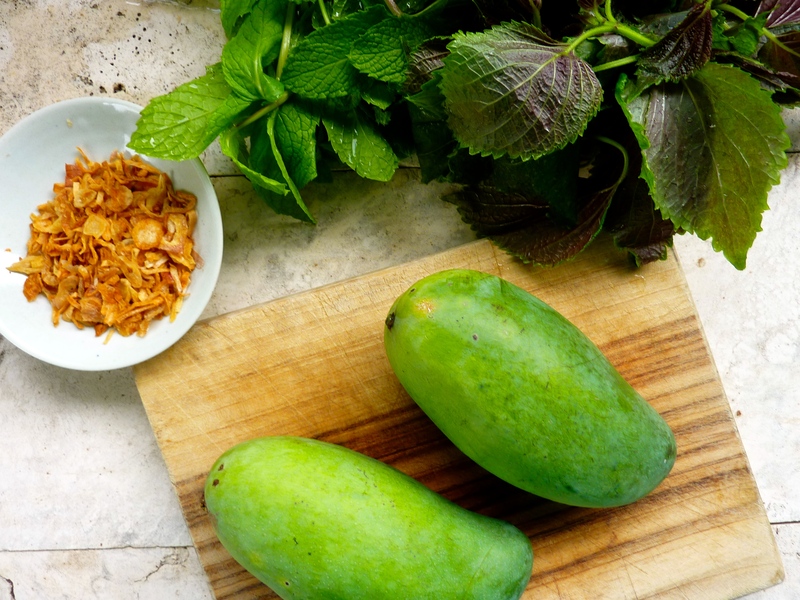 Finely sliced green mangoes (also known as Nam Doc Mai), Vietnamese perilla leaves, and fresh mint make for an Asian salad to reminisce, a salad that lingers long after the last mouth full is eaten. 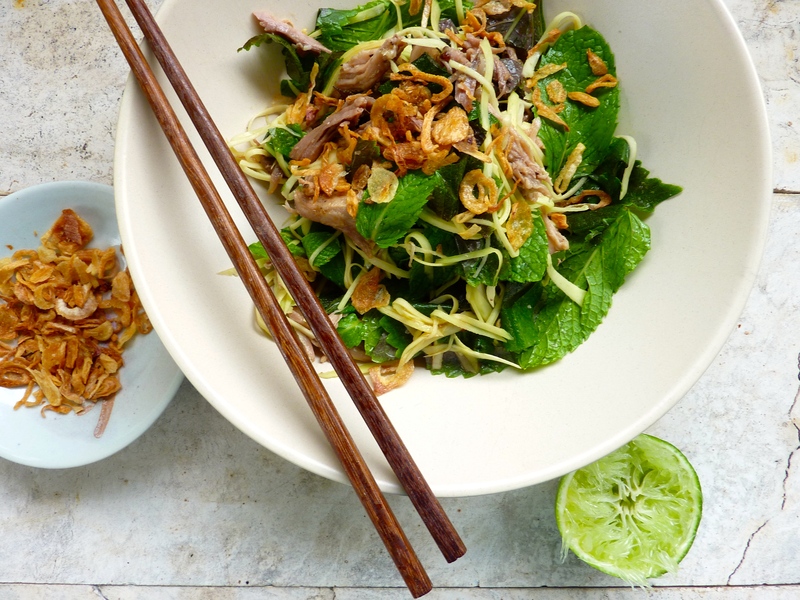 The sweet chilli and lime dressing gives a necessary balance and the fried shallots add the required crunchy texture. They can be purchased from any Asian grocery store and keep well in the pantry if sealed tightly. I served a version of this salad for Christmas day, which included pork crackling and salt and pepper tofu but this is just as tasty and a little simpler to prepare. 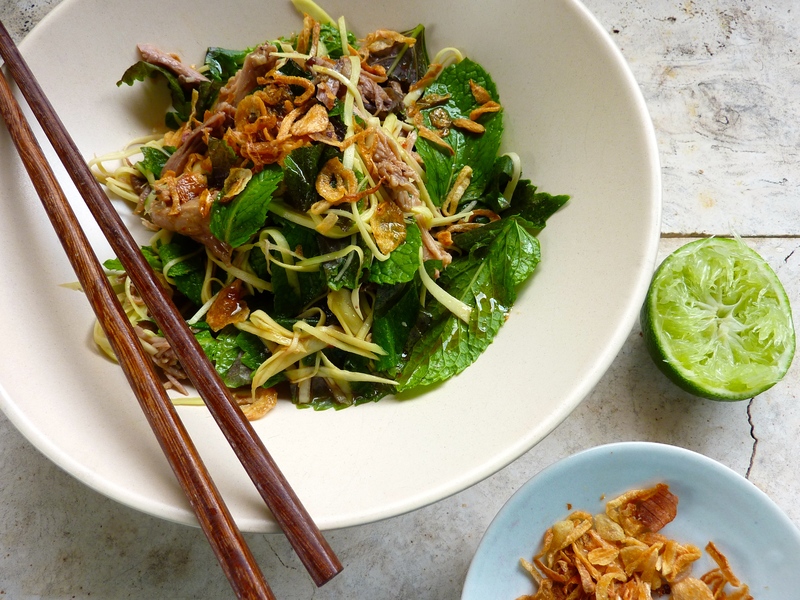 You might also consider stretching the salad a little further and feeding more people by adding a few handfuls of cooked chilled vermicelli noodles, and you can substitute coriander with the perilla leaves if they prove tricky to find. Pre heat oven to 250C. Leave a thin layer of fat on the top of pork and lay the pork on a roasting tray over a deep baking dish. Rub the pork lightly with oil and season well with sea salt and cracked black pepper on both sides. Place in hot oven and roast for 30 minutes. Turn the heat down to 150C. Pour cider into the bottom of pan, cover tightly with foil and place back in the oven to slow cook for 3 hours. After 3 hours, remove pork and stand for 30 minutes. Use two forks to gently pull apart the pork. Reserve the pan juices for the left over pork to reheat it with the juices the next day so it stays soft and succulent. For the dressing whisk all ingredients in a small bowl till well combined. Peel the skin from mangoes and slice thinly with a mandolin, or alternatively use a sharp knife, once mango is in slices use a knife to julienne (slice into thin match sticks). 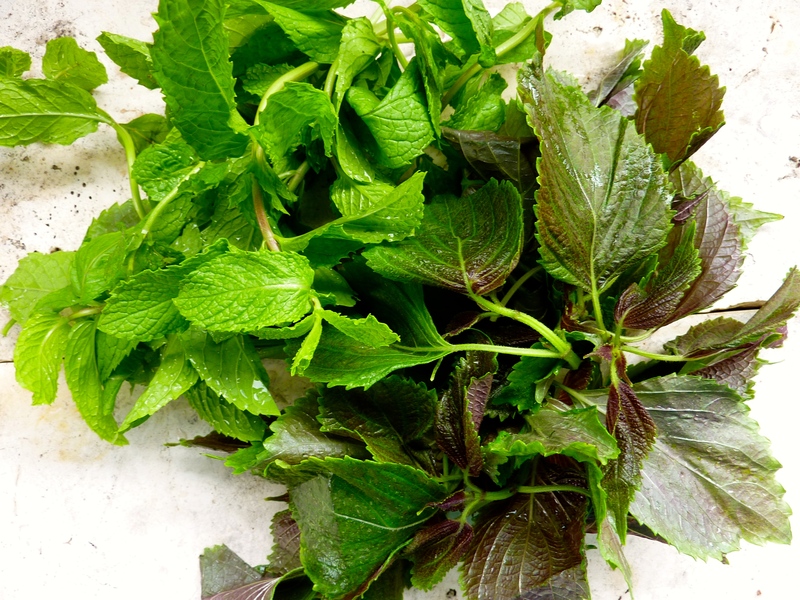 Place sliced mango in a bowl, add roughly chopped perilla leaves and whole mint leaves. Place half the pulled pork in a bowl (refrigerate remaining pork for another meal) and drizzle with 1/2 the dressing. Pour remaining dressing on salad and toss to combine. At this stage, lightly toss the pork with the salad, divide between four bowls, sprinkle with fried shallots and eat immediately.